organization devoted to the protection of wildlife habitat through advocacy and public education. They sought an impartial, scientific assessment of the need to conserve additional wolf range. The study was designed to guide interested conservation organizations and state agencies in their efforts regarding gray wolf range in the Upper Peninsula of Michigan and Northern Wisconsin. The study examines whether range sufficient to support a viable wolf population will persist in Michigan and Wisconsin after the gray wolf is removed from the list of protected species under the federal Endangered Species Act. 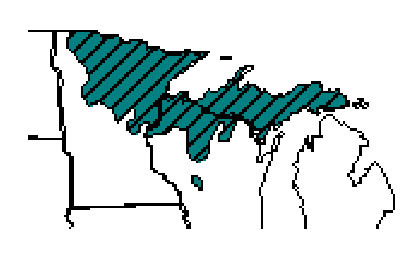 A spatial model was created to estimate the amount of wolf range that will exist in the study area in the future. The model incorporates land ownership, population pressures and land use change. The model predicted that sufficient wolf range will be available in the future and is capable of supporting wolf population numbers well above the minimum viable threshold. A population viability analysis was completed to determine the long-term viability of the population. The estimated amount of future wolf range is capable of supporting a viable wolf population. However, unforeseen events may necessitate additional wolf range conservation. 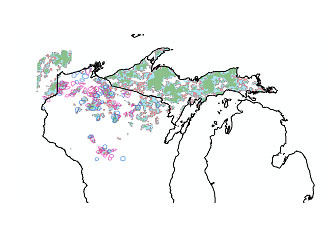 Therefore, land conservation tools, legal protections and education programs were evaluated for their ability to yield further conservation of wolf range in Northern Wisconsin and the Upper Peninsula of Michigan. 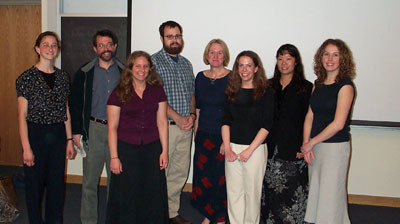 The Gray Wolf Project group presented the final results and recommendations to the SNRE community and representatives of the National Wildlife Federation in April, 2003. The entire results of this project are now available in PDF Format. Click here to download the entire analysis in a complete document (note that this is a large file). To contact the Wolf Group, please email Damon Hearne at dhearne@umich.edu.